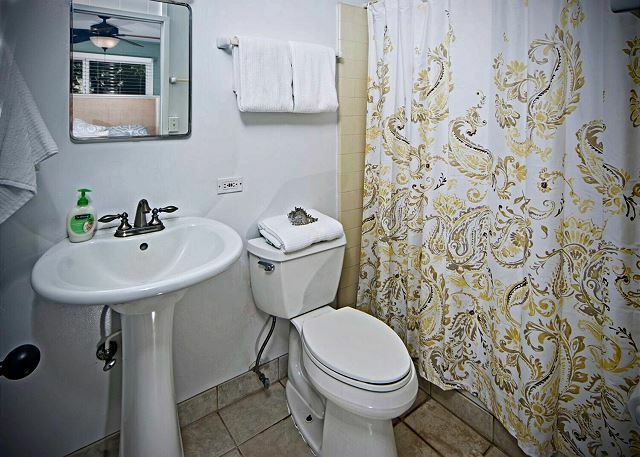 Beachfront | Excellent Snorkeling | AC | Tranquil & Private | Last Min.Rates! 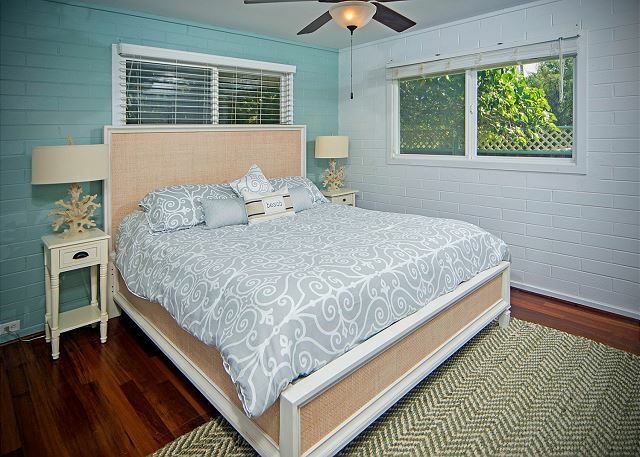 The Coral Home is a charming, sunny three bedroom located directly beach front in a secure and private neighborhood. 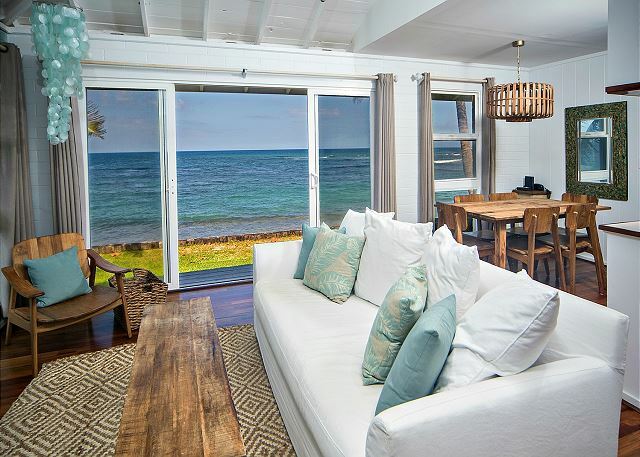 The open kitchen, living room and dining room areas benefit from the loveliest natural light and offer stunning views of the Pacific. 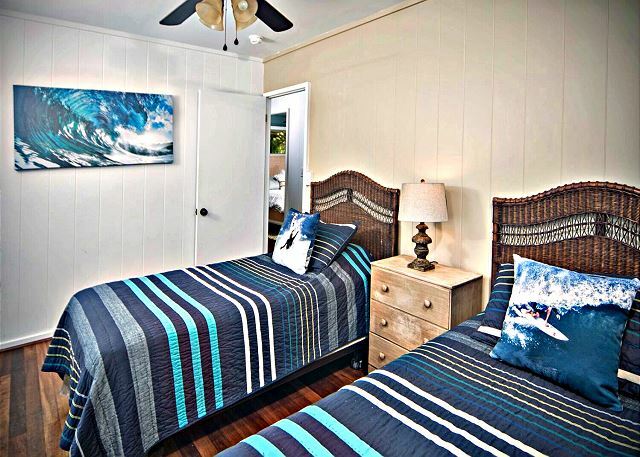 Two of the three bedrooms have ocean views and direct beach access, while the master bedroom amenities include mountain views and private bathroom with tub. All bedrooms have A/C. 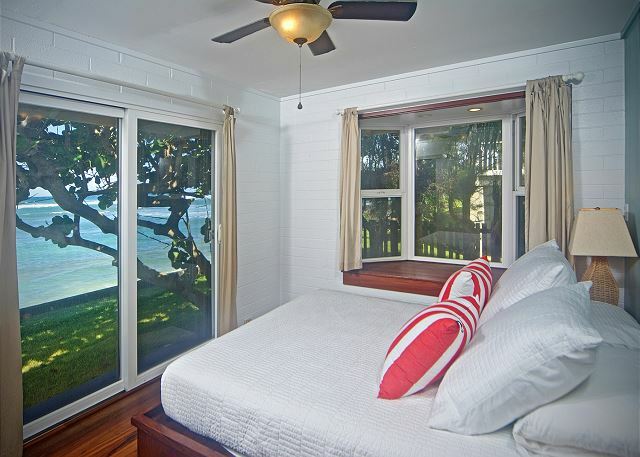 No traffic noise here, instead you will sleep soundly to the incredible sound of lulling waves. 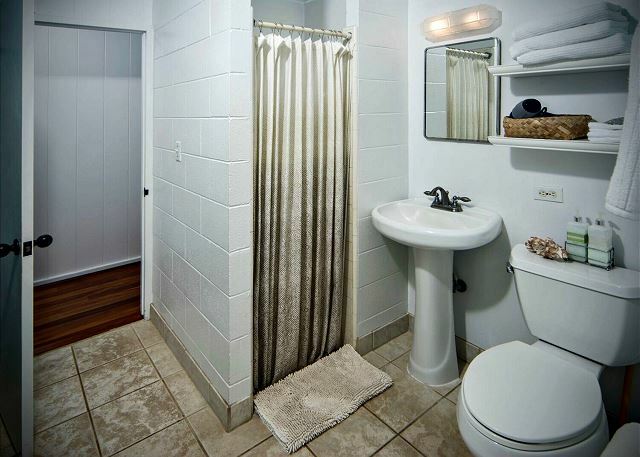 The Coral Home housekeeper takes great pride in her work, you will find the home well stocked and spotless. Our guests here immediately feel relaxed and at home, many come back year after year. 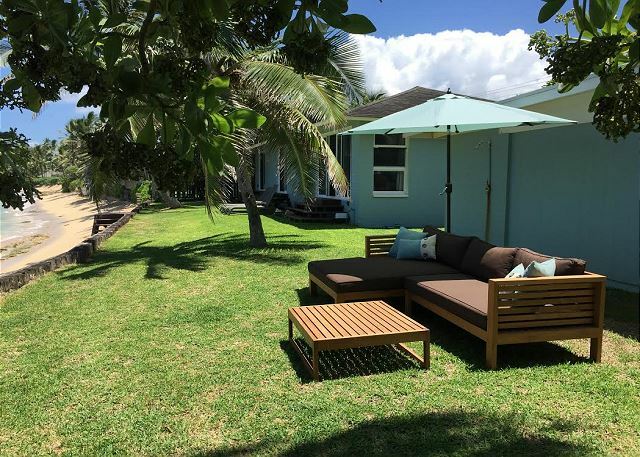 The spacious ocean side yard is perfect for al fresco meals, yoga, and quality time in a lounge chair under a swaying palm tree. Can't you just smell the plumeria's blooming in the air? You have easy ocean access for swimming and snorkeling, and the sand stretches for miles in either direction. You'll be sure to spot sea turtles regularly, see rainbows on the horizon, and in winter months watch whales breaching in the distance. This beach is protected by reef, so swimming, snorkeling and kayaking are possible year round. 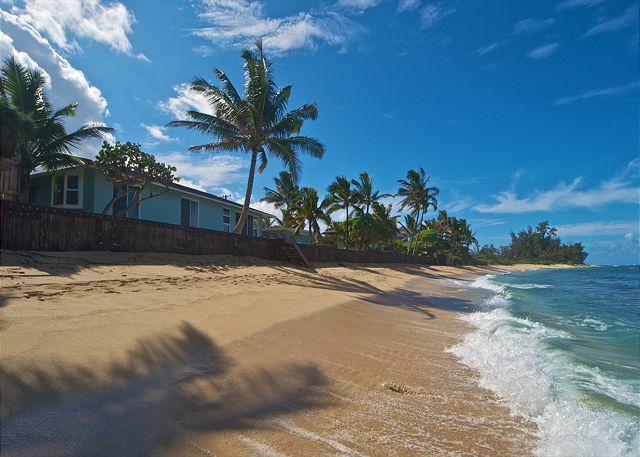 No matter what your daily activity, you'll soon find that every evening living in a beach house ends much the same way - everyone gathered outside cooking dinner on the grill, cool drink in hand, while the sun sets over the Pacific. 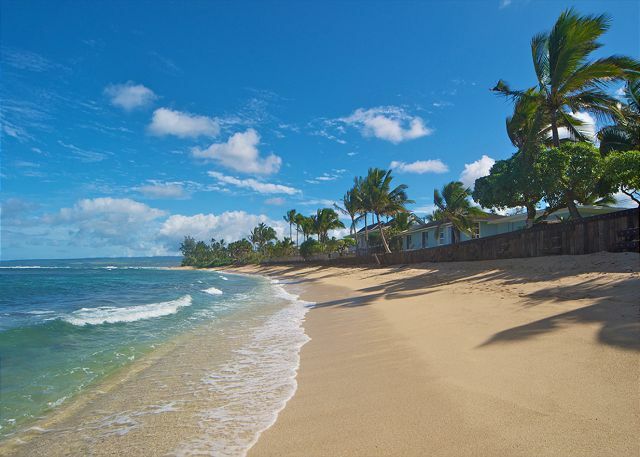 You’ll see why travelers return yearly to the North Shore when you lounge on its golden shores and experience that rarest of sensations - true relaxation. 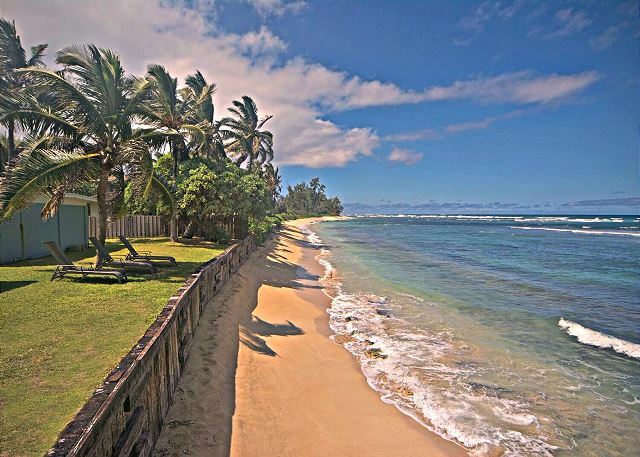 The nearby surf community of Haleiwa has shops, galleries, and endless Aloha. 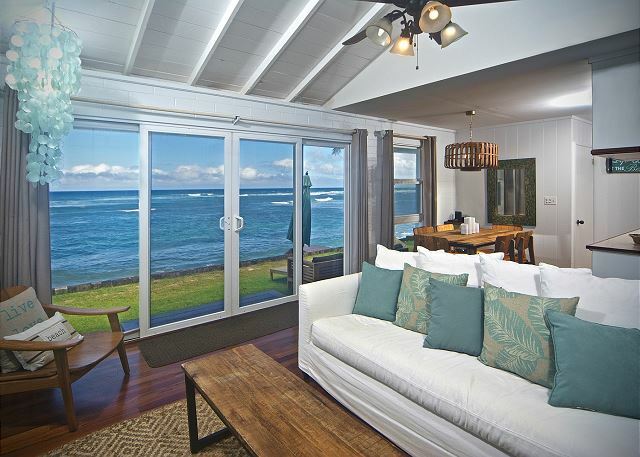 Four star golf and restaurants are available close by at Turtle Bay, though few things can beat the experience of eating fresh fruit smoothies or the morning’s catch from one of Haleiwa’s fantastic food trucks. 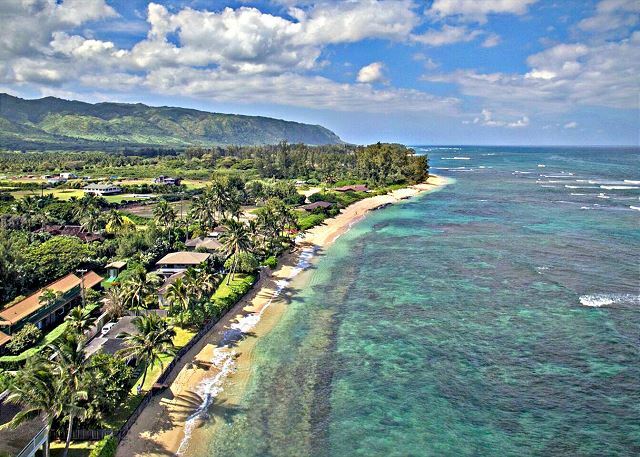 The area boosts tremendous hikes, historical sites, waterfalls, botanical gardens, and, of course, a few of the most famous surf beaches on earth. Pearl Harbor is about 20 miles away, the airport 25, and Waikiki 30. Other: Pack n plays, cribs and kids beds can be rented and delivered. AC in bedrooms only, fans throughout house. The main doors at the house, were broken and doesn’t work the whole time. I love the house and location thanks very much it was beautiful and peasfull. Great place with awesome location! 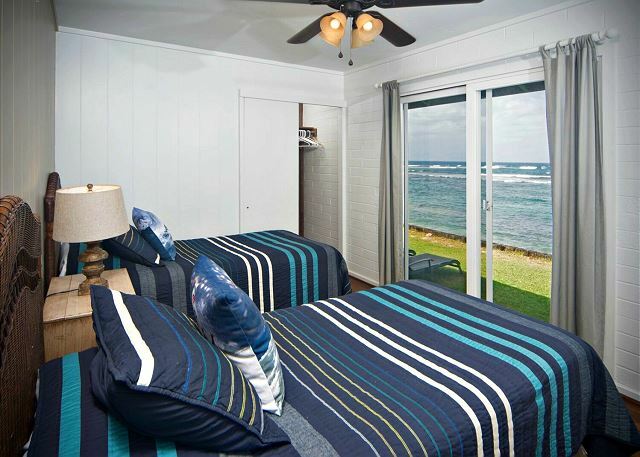 Our North Coast Oahu home was wonderful, cozy and a great location. We came to the north coast for a chance to see large winter waves, and it was great. We were right on the ocean and the water was right there as were the waves. The home was set up wonderfully and had everything one could need and then some. It fit our family of five perfectly. Manager Response: Thank for your taking the time to review, Daberko Family! Mahalo for staying with us, we are so happy you enjoyed yourselves. We spent the first week of our honeymoon at Coral Home. The location was perfect for us. The scenery was beautiful, the ocean out the front door was blue with constant surf. 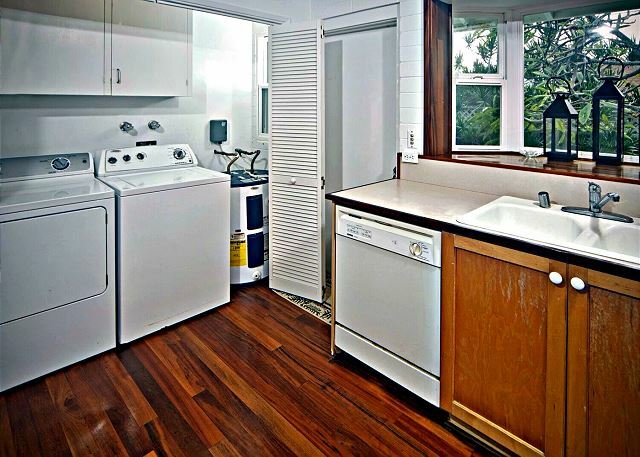 The house was clean and filled with ocean breezes. The only drawback to the location was the distance from all of the historical sites. Really enjoyed the Coral home. We would love to stay here again. The only problems were minor: A smoke alarm had a dead battery and was chirping, but a maintenance man was there in about an hour. And the front gate code did not work, but the one inside the path did. Not a big deal. I would definitely recommend this property. 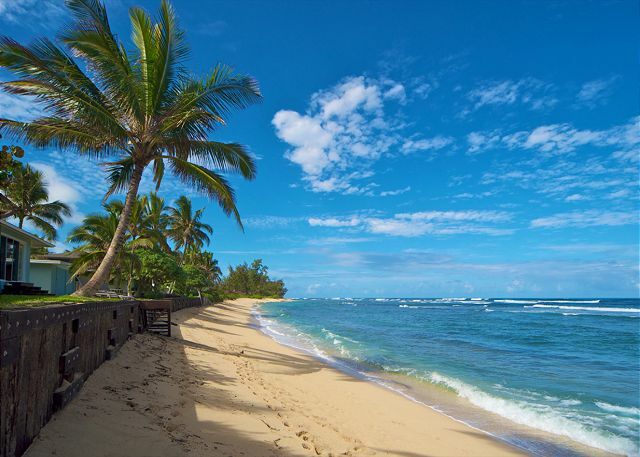 We just love the North Shore and consider this the place to be. 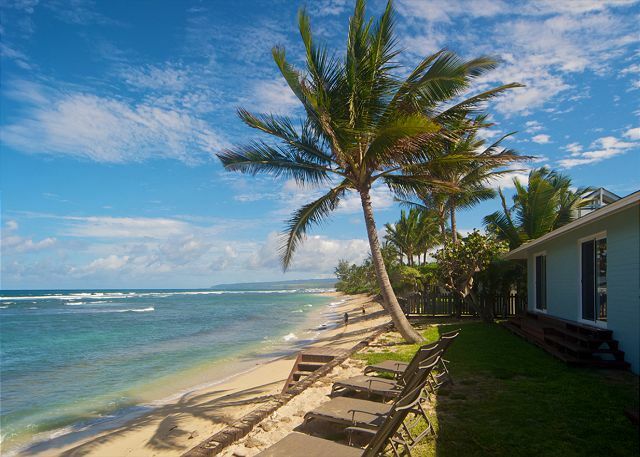 The Coral Home has a unique location right on the ocean front. 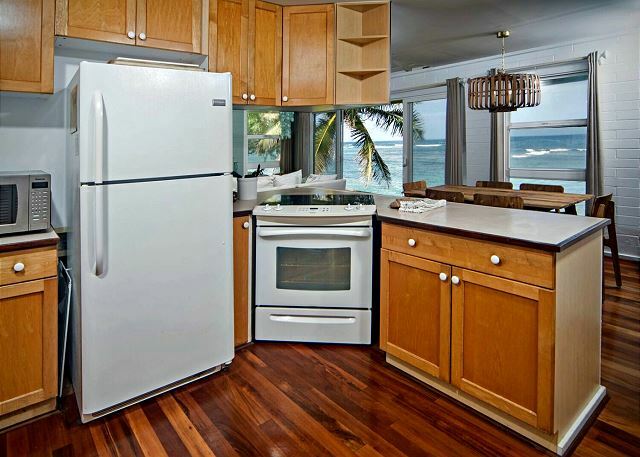 The Coral Home is a nice place with all you need to cook your own food. Yes is does get hot when the wind is not there but most days we were blessed with wind, so we could let the air pass through the house. We only use ac to cool down the bedrooms before got to sleep. As it is so quiet it is no problem to sleep with open windows. Great sound from the ocean though. We loved to sit outside and watch the ocean. We had no problem with bugs. All in all a great stay at the Coral Home. Only one issue was that upon check-out at 9 am the code to the door did not work after we shut the door, but luckily we had all our luggage. 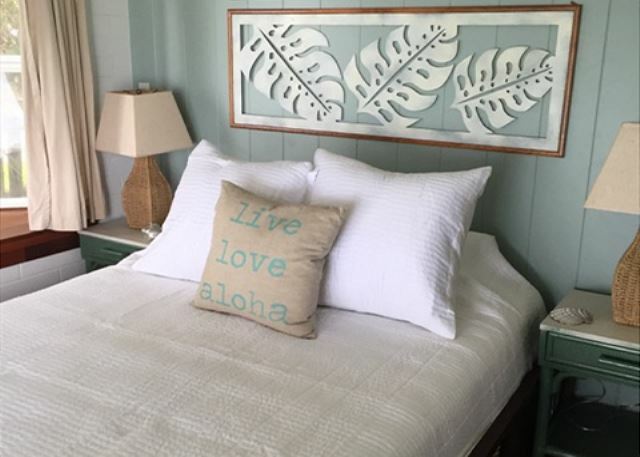 We love the Coral Home. . Well off the beaten path, but just a short 10 minute drive to lovely Haleiwa. . 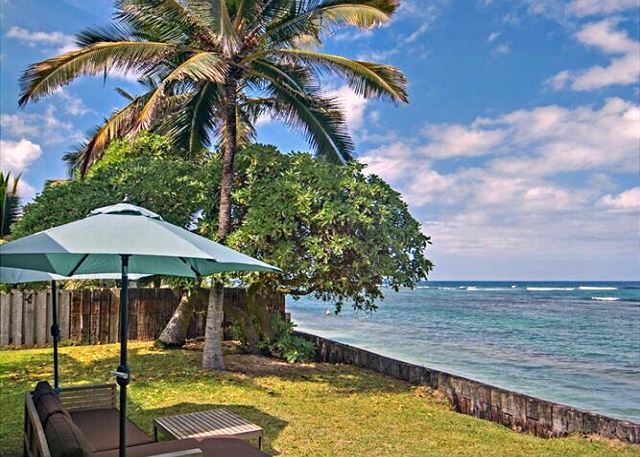 Perfect location. . Amazing private beach with calm , swimable waters . . Snorkeled with tropical fish and a sea turtle. . The house was perfect for us . It had everything we needed . 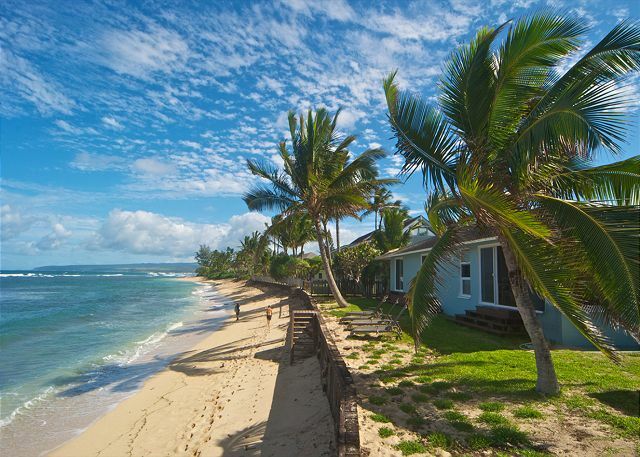 Hopefully the Coral Home is available next time we come to the North Shore. . This was a fabulous place. 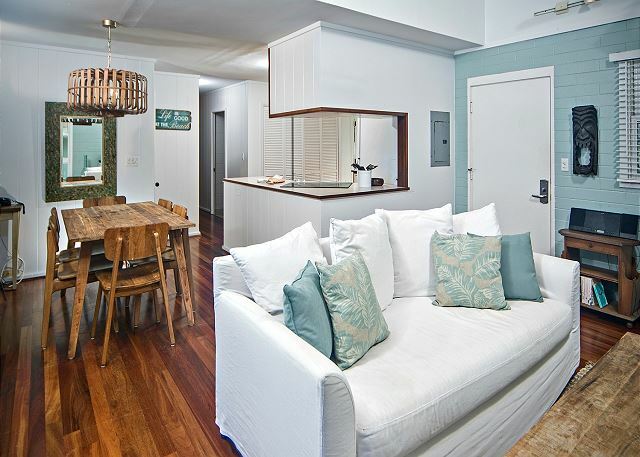 I would happily have purchased it and moved in!I couldn't have been happier with the location, and the home was well built, well furnished, and spacious for the area. We will definitely try to stay here again! The cleaning crew could step it up a notch though. While most things like sheets were plenty clean,there were a few noticeably skipped things like dusty ceiling fan pull chains. The location of the home and the expanse of the property were incredible. Right on a surf break, we watched surfers all day and humpbacks breach in the background. Amazing! 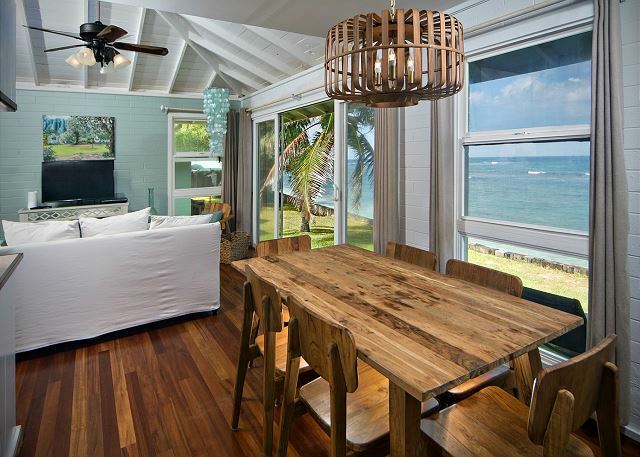 The house, while very clean, is a bit outdated--mainly the appliances and the bathrooms, which could use updates--but other than that it had a great layout, ambiance, and being right on the beach is everything! It is a very quiet and private neighborhood which is what we were looking for. We'd love to come back! The house was perfect for 5 adults.